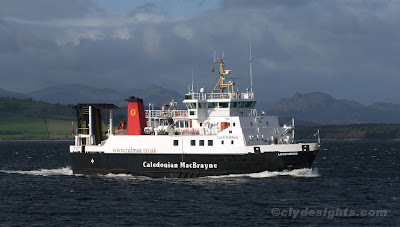 As she has done for the past couple of years, Caledonian MacBrayne's LOCHNEVIS handed over her duties as the Mallaig-Small Isles ferry to a relief vessel, and headed for the Clyde for her annual drydocking. Having left Mallaig late on Saturday evening, she arrived at Gourock shortly after lunchtime on Sunday, and after landing cars belonging to her crew, headed up the river channel to Greenock. Seen passing Greenock, she entered the Garvel Drydock straightaway to commence her survey.